The best thing about America’s Got Talent is that the show stretches the definition of the word “talent” to its very limits, making for very entertaining television. 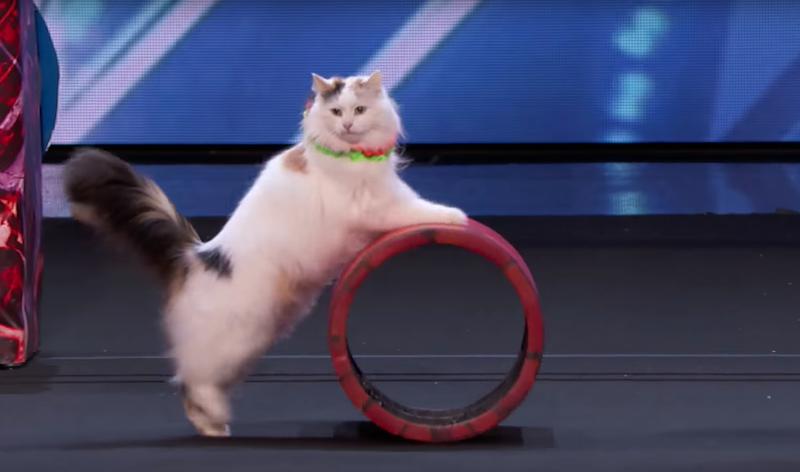 It’s summer, there’s nothing on TV, and this is how I came to learn about the Savitsky Cats, a roving collective of circus animals from the Ukraine who have MORE talent in the tip of their tails than any human does in their whole entire body!! Unfortunately, I do not know the names or ages of these cats, but I do know that one of them vaguely resembles MY cat, whose lifestyle is aspirational only because most of it consists of sleeping like a pile of dirty laundry at the foot of my bed. These cats are not my cat. They are an inspiration. This cat—a sturdy-bodied, thick-furred angel wearing not one but two scrunchies around his or her neck—whose core strength and the agility on the parallel bars has inspired me to do...something. Anything, really. What is there in life that you feel so determined to do that you would strive against your baser instincts to achieve the impossible? Why sit down when you can stand up—on two legs, on four legs, whatever—and thrive? What challenges have you faced? What challenges are on the horizon? Is there anything you see that you want, but just don’t know how to get? Sit with your accomplishments, relish in your success, and prepare yourself for whatever else might come your way. Trust yourself. Trust the process. Be free.